With the Holidays right around the corner I’ve thinking of ways to get my home ready for guests. I love when family & friends gather together at our house, and the more prepared I am, the more relaxed I can be when everyone is here. 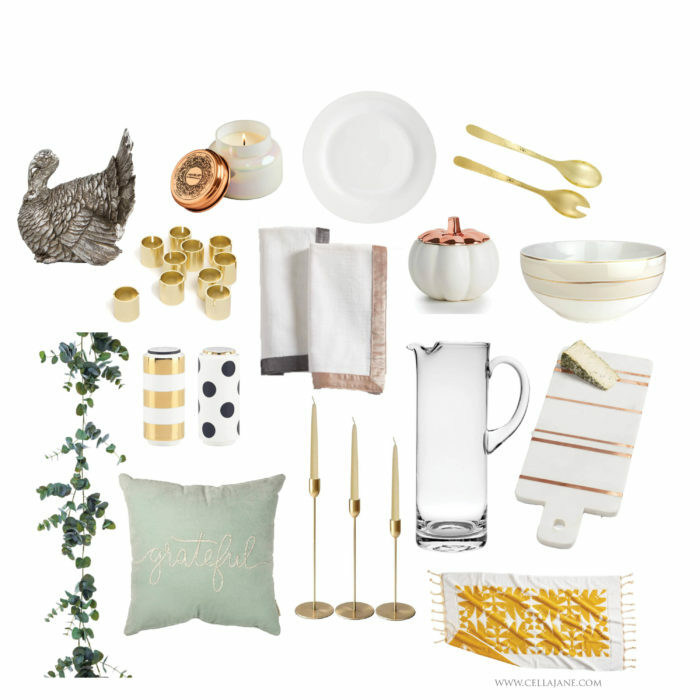 Today I’m sharing some decor I’ve been eyeing with hosting Thanksgiving in mind as well as 7 tips for hosting a large gathering. 1// Have a way for guests to mark their drinking glasses // If you’re hanging out all day it’s easy for people to lose their drinking glass throughout the day. To cut down on unnecessary dishes or trash, use wine charms or glass markers for glass and a sharpie for plastic/paper cups. 2// Light candles // Anywhere your guests are going to be, light a candle. Bathroom, kitchen, dining room, family room — have candles lit. The scents are inviting & the glow is cozy. 3// Keep centerpieces low so everyone can see across the table // No one wants to have to peek around a tall vase or object to talk to the person sitting across from them. Keep things low with a table runner, garland, short vases of flowers or tea lights. Tall candle holders can work if they are skinny & well spaced out. 4// Have pitchers full of water on the table // Even if your guests bring a drink to the table & you have full water glasses on the table, have pitchers of water ready to pour during dinner to avoid extra trips to the kitchen for your guests. 5// Use paper plates & napkins for dessert // There comes a point in the day where no one wants to clean up any more dishes. Having paper plates & napkins ready to go for desserts takes away another layer of clean up and frees up time for you to sit down & truly enjoy dessert and your guests. 6// Put a fresh towel in the bathroom // In addition to a candle lit, a new hand towel for the bathroom makes your bathroom look fresh & clean for your guests. 7// Have a simple activity at the table for the kids // While the kids are at the table put out coloring placemats or cover the kids table with kraft paper. Add a few small cups of crayons on the table and the kids can color, draw, play tic-tac-toe and hopefully the adults can sit back & enjoy adult conversation! Are you guys hosting Thanksgiving this year? What’s your favorite dish to make? Mine is green bean casserole!